I decided to go to SeaWorld Adventure Park today, as I may not have had the time to go due to the approaching Hurricane Jeanne. I arrived at the park just after 9:00am, picked up a map and headed to the Key West at SeaWorld area. I saw some more dolphins up close, (you can never see enough dolphins ), at Dolphin Cove, and went to the underwater viewing area to see them underwater too. After a while in this area, I went to the Key West Dolphin Stadium to watch the Key West Dolphin Fest. A fun show with the normal tricks that you will see at any dolphin show. After the show, I went off to find Kraken, the floorless coaster. Kraken, a 7 inversion floor less coaster, which means that whilst you are sitting there, there is no floor between you and the track. Another short queue, and another great roller coaster. The floorless trains adds a little more adrenaline into the mix. A very exhilarating and fun ride. I continued on round the park and came to the Penguin Encounter, which I walked through, before coming to the Sea Lion and Otter Stadium. Which hosted the Clyde and Seamore take Pirate Island show. This was very funny, the sea lions were funny like always and I think there may have been a few goofs in there. A very good show. Next, the Shark Encounter. This is one of those glass walk-through tunnels that lets you see the sharks above your head. Before the tunnel though, there are lots of tanks with hundreds of different fish in. Always fun to look at. Onwards I go, and I soon come to Wild Artic, a Polar Bear and artic exhibit. This was very nice, it can take a while to walk through if you like to take your time too. Time for something to eat, before heading to Shamu Stadium and The Shamu Adventure. 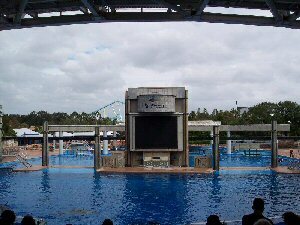 I was told that if I went to SeaWorld, then I had to see The Shamu Adventure, I was not disappointed at all. Before the show started there was a bit of fun with a quiz, which teaches some fun facts too. The show features many more fun facts, and lots of tricks from the whales. It's amazing to see the agility of these huge killer whales. They can jump completely out of the water, getting some distance, and seem very friendly too. 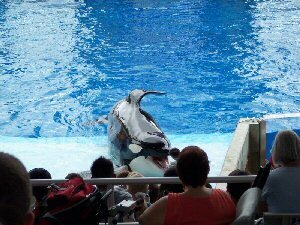 The end of the show consists of Shamu 'playing' with the audience. Jumping and splashing about. Which gets a lot of the people in the first 10 - 15 rows very wet. 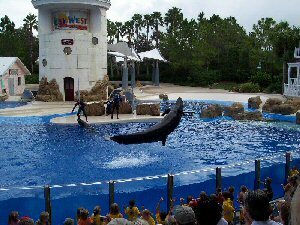 The Shamu Adventure is a great show that you must see if you go to SeaWorld. With the weather starting to deteriorate, clouds rolling in and the wind picking up, I decided to leave at around 3:00pm. It had been a great day out, and I had taken many photos. Back at the hotel, with the time approaching 7:00pm, the wind was starting to pick up. Hurricane Jeanne was getting closer. We had been given some safety leaflets with tips, and all I could do now was stay inside and hope all would be fine when it passed.